Follow Duval Street to the northwest side of the island, past bustling shops, restaurants, and bars, right to the spot where the daily pilgrimage to watch the sunset concludes. There, you will find Ocean Key Resort and Spa. Listed in the 2012 T+L 500, a compendium of the world’s best hotels as selected by Travel + Leisure’s readers, this AAA Four Diamond tropical retreat boasts luxurious guest rooms and suites, award-winning dining and spa amenities, and arguably the best views in Key West. Crowds gather nightly on the resort’s Sunset Pier as boats pass between the harbor and Tank Island, white sails littering the horizon as others take to the water to behold the setting sun. Each sunset brings something new and exciting to the island—just as each new couple brings new challenges to the weddings and events team at Ocean Key. “Everybody has a different idea of what they want for their wedding,” says Tiffany Horton, director of sales at the resort. “Some people are more simple, and some take the pier and completely transform it.” For such occasions, Sunset Pier takes a break from its day job as a hot-spot cantina and becomes home to Ocean Key’s wedding receptions, while the ceremonies take place just steps away near the resort’s pool, overlooking the Gulf of Mexico and in the most advantageous location for ship watching and marveling at the sunset. Couples are encouraged to use the venue creatively and select their own colors, themes, flowers, and other decor. The resort never holds more than one wedding per day, enabling staff members to give each event the utmost level of attention and allowing each marrying couple to shine. “From the time they step onto the property, we want our wedding parties to feel like this is their day, and each event is unique and special,” Horton says. From a Caribbean fiesta to an elegant soiree under the stars, the team at Ocean Key is skilled at taking any couple’s ideas and building the perfect wedding around them. Many of Ocean Key’s wedding parties like to take advantage of the impressive array of amenities the resort has to offer. Award-winning cuisine from Hot Tin Roof restaurant, located on the property, keeps guests satisfied for breakfast, lunch, and dinner, as does the extensive room-service menu. And when a little pampering is in order, they need look no further than SpaTerre, a Noble House Resorts and Hotels signature amenity, which provides a wide range of massage services, facials, mani-pedis, and much more. “A lot of the couples get a massage together just to relax when they get here,” says Horton. The spa even features a room for groups, and often bridal parties, to come in and get mani-pedis or facials together while sipping champagne and enjoying tapas from Hot Tin Roof. 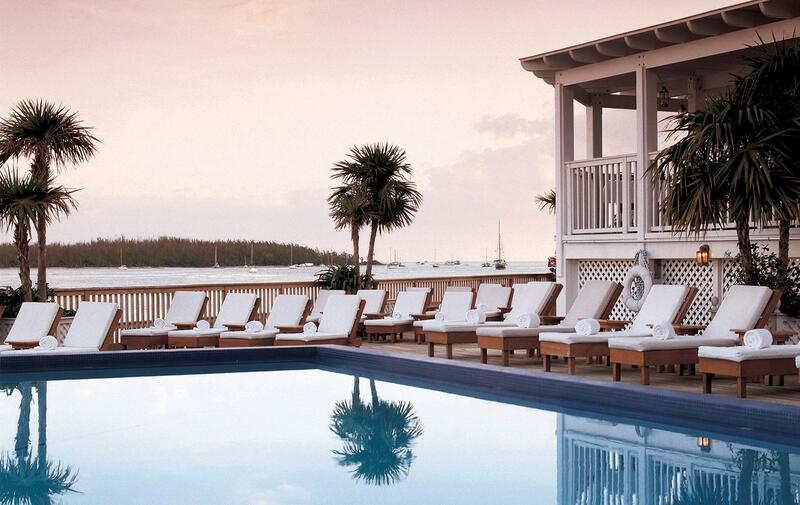 And, for the most romantic experience, of course, Ocean Key does not disappoint. “We always encourage people to book the waterfront rooms,” says Horton. With packages available for honeymooners, returning Ocean Key guests, and even adventurers, the resort has something for everyone. Newlyweds can enjoy a luxurious king bed and Jacuzzi tub—big enough for two—in the comfort of their suite, then step out onto a private balcony overlooking Sunset Pier and the beautiful blue waters of paradise. Janel and Oscar Cabrera share their first dance as a married couple during their reception on Sunset Pier at Ocean Key Resort and Spa. Whether for saying “I do,” enjoying a honeymoon, or simply escaping to a tropical island full of history, beauty, and excitement, Key West’s Ocean Key Resort and Spa lies right on the horizon where dreams meet reality. VIE assistant editor Jordan Staggs (right) and her mom, Tonya Meyer, pose at the marker of the southernmost point in the continental United States in Key West, Florida. Ninety miles to Cuba!